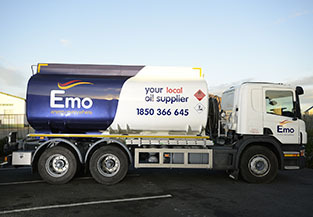 Emo’s Road Diesel (DERV) prices are one of the most competitive available in the Irish Market. Our road fuels are of the highest quality and can be supplied nationwide. We can supply bulk deliveries nationwide by rigid or artic truck and we can also offer fuel card services. For an express diesel fuel quotation, please select your product type, quantity and location from our Express Quotation Engine or alternatively contact a member of your team by clicking on the team member icon on the right-hand side. Our nationwide depot network combined with our extensive artic and rigid truck fleet means Emo can service all parts of Ireland for both bulk and rigid deliveries. We guarantee next day delivery and endeavour to ensure same day delivery when possible. Our Diesel is of the highest quality, with regular terminal sample testing. Emo Oil, as part of DCC Energy, can offer a combination of pricing and credit terms that are unmatched by our competitors. 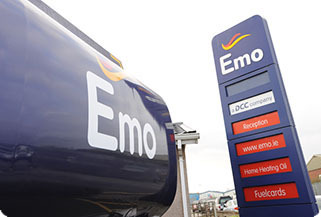 That’s why more and more companies are turning to Emo for a tailored diesel fuel supply agreement, to find out more please contact a member of our Commercial Team by clicking on the icon in the right-hand corner.